Walking through the exhibition space of Klokgebouw, a weird alien-like object floating up in the ceiling can’t go unnoticed. 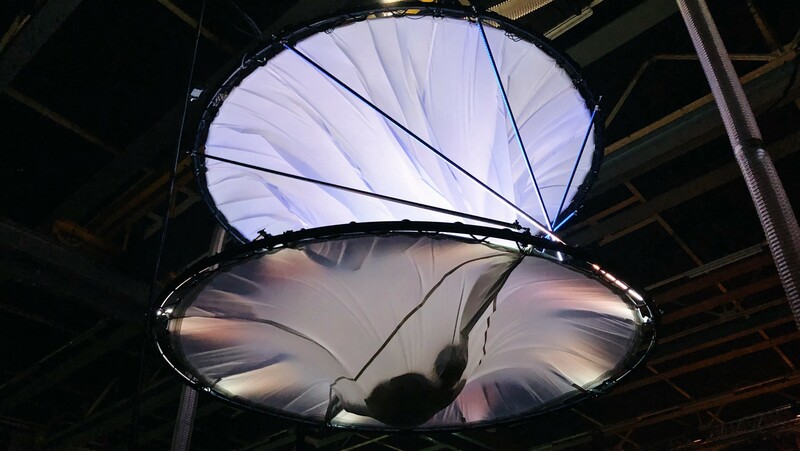 Teun Vonk’s A Sense of Gravity is a dynamic immersive sculpture where the participant is put inside an abstract space that changes shape and volume through air pressure. Contrary to what some visitors might expect, the goal of the work is not to make you experience zero gravity, but rather to create a more abstract, tactile and visual sensation and play with the way we perceive space. “We often think about gravity as wanting to be weightless, but gravity is everything around us. I wanted to make something that makes you more conscious about gravity once you’re on the ground,” explains Teun. A Sense of Gravity is a result of an extensive study, “I did a lot of research with my body and how I experience gravity. When I received the first grant for this work, I did various experiments in my studio and learned skydiving to get to the very essence of gravity. I tried to incorporate all those experiences into this piece.” This explains the brief disorientation the work tends to evoke. “At one point it felt like I was upside down and wasn’t sure about the position of my body anymore,” shares a visitor who just returned from her 7 minute-long journey. STRP explores scenarios for a positive future in 2019 and 2020. STRP looks to the future with an open and critical view. We have had enough of the dark and tough flirt with dystopia and ask ourselves out loud: how in heaven’s name can we come through this conservative and fear-driven period together?